Free Text to Speech on macOS Helps Reading and Writing. The brain is an extremely complex infrastructure of neural highways and byways, and each student has their own unique pattern of established pathways as well as cognitive based strengths and weaknesses. As a result, defining the best remedial techniques for spelling requires a mindful approach that evaluates the cognitive based causes of the spelling difficulty and then tailors a specific remedial approach. I wanted to do something special to thank you for your interest and patronage. 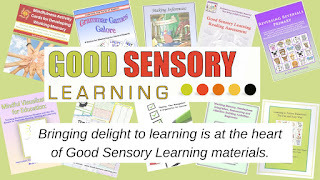 On my educational publishing site, Good Sensory Learning, I offer mindful and multisensory educational materials for learning specialists, educational therapists, teachers, homeschoolers and more. In particular, you can find fun, educational lessons, assessments, and cognitive remedial tools to name a few. I also offer bundles for specific areas of difficulty such as dyslexia, executive functioning, attention, visualization and working memory. These bundles are already discounted. However, until December 25th 2016, I am offering an additional 20% off all these bundles. I have never offered a promotion like this, but I want to make my already affordable products even more accessible for those that need to watch their pennies. Do you want the FREEDOM and INDEPENDENCE to make a difference? Do you know what it takes to CONNECT with and EMPOWER students? Do you want to be a part of a MULTISENSORY, TAILORED and PERSONALIZED method that you can deliver in your own private practice while having access to a support community of likeminded professionals? 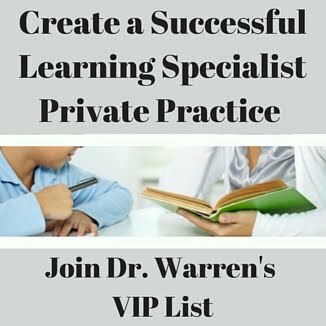 Whether you would like to create a private practice from scratch, or you already have an established business, I would love to help you. You can now gain access to my secrets, expertise, methods, swipe notes and a support community of likeminded professionals as well as a growing selection of promotions from the best resources and companies. 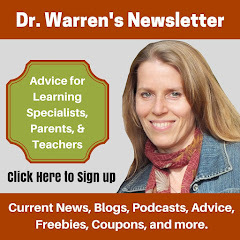 This and more is all available in my evergreen course Create a Successful Learning Specialist Course in 60 Days. If you Answered Yes to Any of the Questions Above, Watch this Video to Learn More.